While the first generation of HCI solutions aimed at operational simplicity and rapid time to service, users were often creating silos of HCI clusters for specific apps—negating the management simplicity for which it was originally destined to bolster. As such, HCI solutions will need to evolve to address many of the challenges that the first-generation was not designed to tackle: workload consolidation, independent and flexible scaling, and predictable performance. 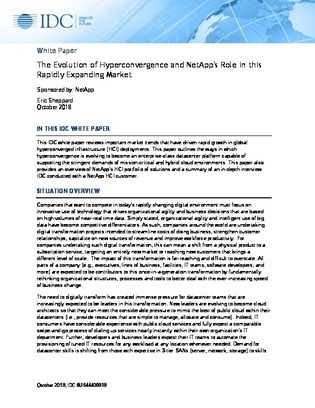 This IDC paper reviews the market trends driving growth in HCI deployments, explains how HCI is evolving to support the stringent demands hybrid and multi-cloud environments, and highlights the benefits of NetApp's HCI portfolio in particular. Download it here for more on the second generation of HCI and discover what it may mean for your business moving forward.